Increase the beauty and property value of your home with gorgeous ceramic tile flooring. 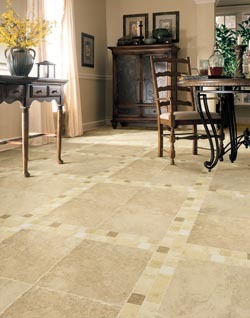 We offer one of the widest selections of ceramic tile in the area. Whether your bathroom looks dingy, your kitchen needs to be updated, or your laundry room floor has seen better days, our sales associate can help you find the right ceramic floor tiles to match your décor and meet your budget. Stop by our massive showroom to browse our stunning collections and learn more about the major brands our store carries. As one of the largest flooring retailers in the area, our store stocks ceramic tile flooring from a number of trusted, nationwide brands. From current best-sellers to timeless classics, we always keep a diverse array of manufacturers in our inventory. The brands we recommend for tile floor made of ceramic include FloorCraft™, HomeCraft™, Design Distinctions™, Daltile™, American Olean™, Bellisima™, and Star Values™. With so many choices you are sure to find the floors that best suit your needs in looks, performance, and price. Each one of these brands has established itself as a top-notch manufacturer who produces fine flooring materials. We keep these ceramic tile brands in stock and recommend them to homeowners like you because we believe they are among the industry’s best. If you ever have any questions about the brands we carry, please speak with our knowledgeable sales associates. They will be happy to inform you about the distinct advantages of each individual manufacturer and their products. Meld form with function in your home by installing ceramic tile flooring. Tile is renowned for its elegant appearance, as well as its enduring beauty. It is one of the longest lasting flooring options available on the market. When installed appropriately and properly maintained, ceramic tile continues to look new many years after its purchase. Thanks to its durability, it resists scratching, denting, and chipping. Ceramic tile is highly water-resistant, making it ideal for use in all of the wet areas of your house. In addition to its protection against moisture, tile is also stain-resistant and easy to clean. All you have to do is vacuum and mop regularly to keep it looking like new. Whether you install ceramic tile flooring in just your bathrooms or throughout your home, you are making a smart investment in your home’s long-term value. The quality of your ceramic tile installation is as important as the quality of the materials you choose. Save yourself the stress by allowing our store’s team of certified workers to install it for you. This affordable and convenient service is available through our store following your purchase. Our installers have the training and skills to correctly and efficiently install any room or area that includes a tile floor made of ceramic or any kind of ceramic tile flooring products sold through our showroom. Trust us to get the job done right so your investment will look great and last for many years to come. As part of the Flooring America family, we have the buying power to bring you the highest quality brands at the area’s lowest prices. Take advantage of our low pricing to stock up on all the flooring materials you need for your home improvement project. To ensure you love your flooring investment, we offer an Ultimate Confidence Guarantee. Available on certain ceramic tile flooring products, this guarantee means that if you are not satisfied with your floor after living with it for 30 days, we will cover the full cost of its replacement. Visit our store to learn more about the advantages of ceramic tile. While you’re here, ask about our special financing and outstanding warranty options. Contact our store for more information on the types of ceramic tile products we carry. We’re proud to serve customers throughout Eugene, Springfield, Junction City, Harrisburg, and Corvallis, Oregon, as well as the surrounding areas.